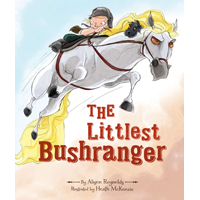 The Littlest Bushranger is a children's picture book, written by Alison Reynolds, illustrated by Heath Mackenzie and published by The Five Mile Press (2013.) I've previously reviewed Reynolds' and Mackenzie's A Year with Marmalade and Mackenzie's The Australian Twelve Days of Christmas. The story starts with a peaceful and familiar scene - Lil sets off for school leaving younger brother Jack alone and a bit forlorn. Luckily Jack has his imagination, because suddenly, Wham! an Outlaw swoops and we readers are swept up into Jack's dramatic adventure. He battles fierce foes and the brutal elements on his trusty steed until he retrieves the stolen booty, and we are left breathless but contented over a very satisfying tale. Mackenzie's artwork enthrals right from the The Littlest Bushranger's cover. We want to quickly open the book and discover what Jack and his horse are chasing and why. It's only as the story progresses that we start to gain an inkling of reality as opposed to imagination. Kids will love identifying the everyday objects that imagination transforms and finding Hector the dog on each page! The light-hearted and energetic illustrations go beautifully with Reynolds' exciting story, making this book a wonderful choice for children under 8. Something American children would definitely need to find out about!